I am brainstorming for ideas to bring to our 'Halloween-themed' food group this weekend. 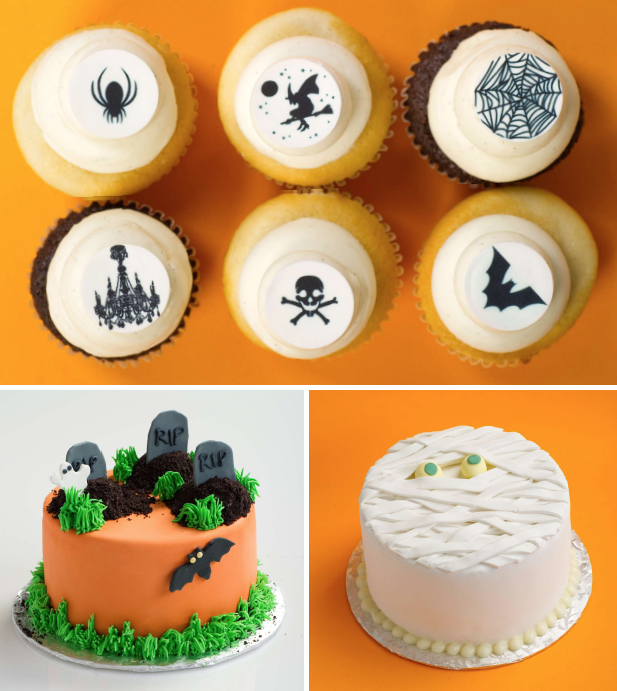 I love the elegant simplicity of these Halloween cakes and cupcakes from Sweet Cupcakes out of Boston. That mummy cake is awesome! that mummy cake is so precious! Ooooh! What inspiring ideas. I love the mummy--it looks so cool and would probably be fairly easy to do if you knew how to do over-lapping icing. these are so, so cool! We're posting some cake recipes, although not a recipe as such, can I link to this? Oh, no, they are fantastic! So funny! the mummy cake is hilarious! I am positively addicted to Sweet cupcakes. Their designs for some of the other holidays are cute too. I love the mummy cake! I just can't get enough of halloween! !